Only you will know it’s there! Incognito braces create memorable results with the minimum of fuss for adults and teenage patients. If you’re looking to keep your orthodontic treatment hidden, Incognito is the answer. Fitted fully behind your teeth, Incognito is one of the most discrete treatments available. It gives you the confidence to get on with life as normal, because the appliance can’t be seen in your mouth. Incognito is the perfect choice if appearance is vital, or if you simply want the least noticeable way to straighten your teeth. There may be a short period of discomfort following the fitting, but you will very quickly adapt and find it a comfortable fit. With Incognito, intelligent brackets and robotic wires are specially engineered to move your teeth by precise degrees. The latest state of the art CAD/CAM technology is used to ensure outstanding, long-lasting results. 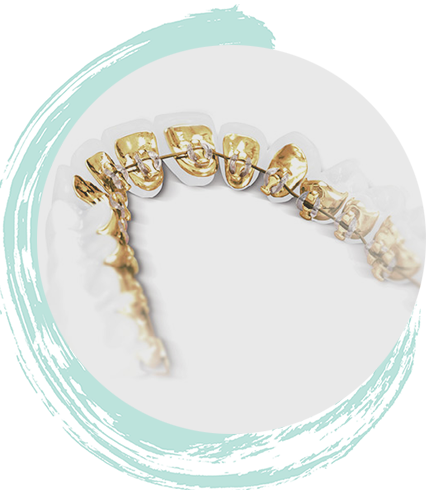 Gold alloy brackets are then individually cast, designed flat for maximum comfort and polished smooth to prevent any interference with speech. While Incognito treatment may cost a little more than other options, it is the only fully customised treatment that sits out of sight behind your teeth. This makes it a good investment for many of our patients.